Europe’s TFET project; next-gen imprint; valleytronics. A new European project has revealed more details about its plans to develop a next-generation chip technology called tunnel field-effect transistors (TFETs). EPFL is coordinating this new European research project, dubbed E2SWITCH. The project also includes IBM, Forschungszentrum Jülich, the University of Lund, ETHZ, Imec, CCS, SCIPROM and IUNET. The project has been funded for up to 4.3 million euros over 42 months. The mission of the project is to develop TFETs at voltages below 0.25V. The devices will make use of SiGe/Ge and III-V materials and other technologies. For example, the project plans to explore new device concepts, such as a density-of-state (DOS) switch exploiting the effects of dimensionality. The DOS switch could deliver a sub-threshold swing less than 10mV/decade. The University of Twente has developed a next-generation nanoimprint technology. 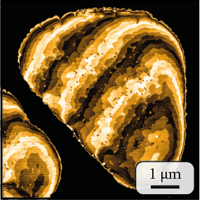 The process creates nanostructures using tiny stamps. It combines soft lithography with pulsed laser deposition (PLD), which enables the development of heteroepitaxial patterns of perovskite oxide materials. The mold used for creating patterns consists of polymer material called polydimethylsiloxane (PDMS). Using PDMS as a mold, a pattern of zinc oxide can be placed on the perovskite. Then, a sandwich of different materials can be made using PLD. Zinc oxide is used because of its compatibility with the high temperatures reached during the PLD process. PLD, or laser ablation, can be used to deposit complex materials on substrates. PLD is different than other physical vapor deposition techniques. In PLD, a high power laser is used. The laser evaporates material from a target. The vaporized material, in turn, condenses on a substrate. Using PLD, the University of Twente MESA+ Research Institute and SolMateS recently put a new twist on the finFET. 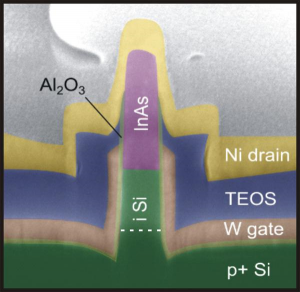 A piezoelectric stressor layer has been deposited around the finFET, thereby enabling what researchers call the PiezoFET. The PiezoFET could enable steep sub-threshold slope devices. In the lab, this device was also able to reduce the leakage by a factor of five. Electronic components store information using the electrical charge of an electron. This requires moving electrons from one point to another, which create unwanted energy consumption. To harness the properties of electrons, researchers have been exploring the field of spintronics. This, in turn, could one day enable new devices that consume less power. Riken, the University of Tokyo and Hiroshima University have put a new spin on spintronics. Researchers have devised ultrathin films of a semiconducting material, which forms the basis of a technology called valleytronics. Researchers used spectroscopy techniques to identify valleys in the band structure of an ultrathin layer of molybdenum disulfide. Molybdenum disulfide is a member of a family of 2D materials known as transition metal dichalcogenides. Researchers created films consisting of one to four atomic layers of molybdenum disulfide. The atoms in the layers were slightly shifted from those in the level beneath, meaning researchers were also to harness the spin of electrons. “We uncovered strong coupling between the valley and spin degrees of freedom,” said Iwasa.